Jordan's dad Herman, who already plays bass in the duo's live band, lends his vocals to the reggae-influenced track Wind Up, while his mum Emma Boulting sings on another song titled Lunatic, reported The Sun. They join rumoured collaborators Fatboy Slim and Pharrell Williams. The Wire star Dominic West also features in a music video on the upcoming album. "We asked him to play this character of a drunk uncle at a barbecue and he went for it. He's such a boss. His daughter thinks we're quite cool, that helped us out," said Jordan. 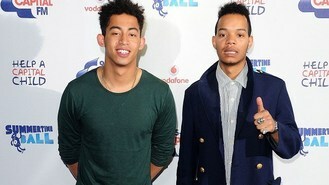 Rizzle Kicks - comprising of Jordan 'Rizzle' and Harley 'Sylvester' Alexander-Sule - will release Roaring 20s, the follow-up to their 2011 debut Stereo Typical, on September 2. Their new single Lost Generation will precede the album, as it's out on August 26.